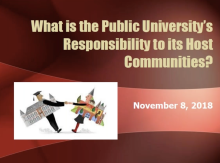 What is the Public University’s Responsibility to its Host Communities? Ohio State's Dr. Stephen Gavazzi, and West Virginia University, President E. Gordon Gee have written a brand-new book on the 21st-century mission of America’s public and land-grant universities. Land Grant Universities for the Future, published by Johns Hopkins University Press, delves into the most pressing issues facing our nation’s public institutions of higher learning at this moment in history. How Do University and Municipal Leaders View Town-Gown Relationships? 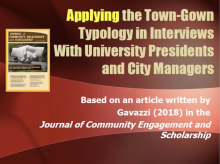 Dr. Gavazzi will talk about his findings and answer questions from his most recent article and address the following core issues surrounding campus-community leadership: What do we know about the impact that university and municipal leaders have on town-gown relationships? How do university presidents and city managers view themselves and their relationships with each other? What are some key guidelines for understanding how the university and municipal leaders can create more harmonious town-gown relationships? This webinar will focus on the comparison and contrast of perceptions that college students and community residents maintain about the characteristics and qualities of town-gown relationships. Specific attention will be paid to data collected through use of the Optimal College Town Assessment (OCTA) from students enrolled in two large comprehensive universities and the corresponding residents from the respective classic college towns. Implications for community engagement strategies will also be presented in this webinar. Alcohol Prevention Pilot Study Part 2 - What Does the Combined Database Tell Us? 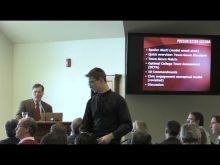 Join Dr. Stephen Gavazzi, author of The Optimal Town-Gown Marriage, and Founder of College Town Assessment as he shares some of the results of the campuses and communities across Ohio who used the OCTA to assess environmental factors that contribute to alcohol use and abuse in college-age populations. 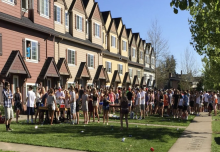 Underage alcohol consumption continues to generate significant concerns for campuses and communities across the nation. College Town Assessment LLC has teamed up with the Prevention Action Alliance (https://preventionactionalliance.org) as part of the Ohio College Initiative to Enhance Student Wellness initiative. A select group of campuses and communities across Ohio are piloting a new set of items designed to assess environmental factors that contribute to alcohol use and abuse in college-age populations. This webinar will provide important information about how data generated by the OCTA will be used to create and implement evidence-based prevention plans for campus and community partners. 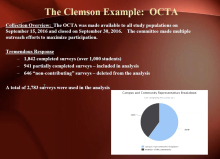 This webinar will outline the process taken by Clemson University as they implemented the Online College Town Assessment (OCTA) this past fall. Jeff will share key aspects to success and some of the benefits of reaching out to all constituencies for feedback. 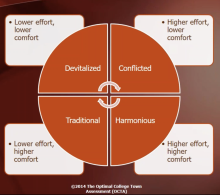 The presentation reflects on Michael's 2012 book that argues that, in order for communities that are home to colleges and universities to move toward becoming harmonious places to live, work and learn, they will have to forge new and innovative partnerships with these institutions and engage in a much greater strategic governance approach. 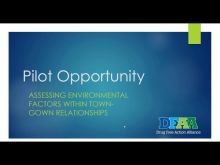 This webinar explains how the Optimal College Town Assessment takes the guesswork out of town-gown relations and makes an immediate impact - just by asking for feedback. 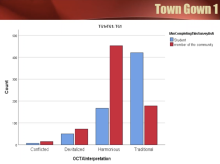 You will receive the background on the marriage typology for town-gown relationships and an overview of the Online College Town Assessment (OCTA) and its capabilities and results. 2016 Civic Engagement Conference, Brigham Young University, Provo, UT. 2016 International Town-Gown Association (ITGA) Conference, Chicago, IL. Panelists: Dr. Doug Baker (President, Northern Illinois University), Mr. John Rey (Mayor, DeKalb, IL), and Anne Marie Gaura (City Manager, DeKalb, IL). 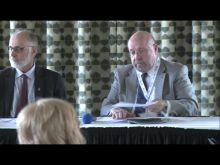 Panel Moderator: Stephen M. Gavazzi (The Ohio State University). 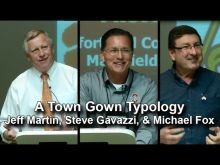 2014 International Town-Gown Association (ITGA) Conference, Clemson, SC.